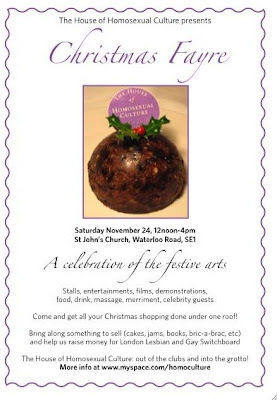 This coming Saturday, I’m going to be spending the day at the above, running the tea stall. There’ll be beverages, and fairy cakes – of course – and Santa’s little helpers of every gender. The wonderful writer Sarah Waters will be opening it. So if you’re in London, come on down. I won’t be the only bi curiosity on show: those socially-minded folks The Bisexual Underground will have a stall. They meet monthly in a London pub for darts, board games, chatting and so forth. And I think the Bi Underground is about it for the organised London bi scene at the moment – I can’t even tell if the London Bi women’s group is still going, or the London main group that was active for 20 years. Of course, there are places like fetish superclub Torture Garden – a “not safe for work site” - of course, where there is no shortage of behavioural bisexuality on display. Male/male couples, female/female couples, female/male couples, groups of friends or lovers, people who are clearly transsexual or whose gender is hard to determine… Everyone can be gorgeous if they have made an effort; everyone has a chance of being desired by someone there. Is there a bi culture? I’ve been asking myself this question quite often lately and I think the answer is probably, sadly, no. The reason for the question is that I’m hanging out a lot with, and seeing lots of events advertising: lesbian and gay culture, lesbian and gay communities, bla bla bla. This event is, after all, organised by the House of Homosexual Culture. They are great blokes and I love them. Bisexuals have a place on the gay scene, and always have had, even if we haven’t been recognised. But is that enough? Could there ever be a house of bisexual culture? It's hard to imagine. Bi people are too diverse. That’s why I have a link called 57 Varieties. Some bi people veer towards gay culture, others straight. There’s no one thing we all want. There’s a queer culture – encompassing all sorts of people who happen to be not mainstream heterosexual, but which leaves out many “straight-acting” bis. And there are subcultures with lots of bisexual people – swingers to anarchists and hippies (well, I think the anarchist bit is true, anyway). But can you call the few bi groups, conferences, newsletters and so on a culture? Not really. I’ve tried to define (for myself) what “a bisexual culture” might encompass but I can’t. Clothes, creativity, music, secret signals to indicate to someone that you might be bi? No. There isn't any of that. There is, though, a history of bisexuality – in particular how it was seen by the general public - ranging from bohemians and the Bloomsbury Group in the 1920s and 30s, David Bowie in the 70s, the influence of feminism and the sexual liberation movements around the same time, plus the organised bi community. That’s something you can trace, and I’ve stressed that quite a bit in this blog. It’s something to hold on to. I’ve been doing a lot of reading recently about unforeseen consequences – the “unknown unknowns”, if you like. You have no idea that something could happen because A had never crossed your mind as having anything to do with B. It certainly resonates with what’s happened to my blog viewing figures. Ever since I posted up a picture of Angelina Jolie on this blog a little more than a month ago, my reader figures have gone through the roof. Well, as far as “the roof” for a non-publicised, non-monetised, non-famous blog like this is concerned. Today, more than 1,000 people will read this blog. Well, I say read, but in actual fact it’s more like: click on for a nanosecond, see what’s here, then click off immediately. This blog is currently listed as number two on Google Images’ places to see Angelina Jolie. And then last week, aol.com put a link to this blog right in the middle of a story. Mini jackpot. So, if all I wanted was “clicks”, then all I’d have to do is post endless pictures of Angelina Jolie – with perhaps the occasional picture of a buff-looking man to attract a few people who were into them. But that’s not all I want. I want people to actually read this blog, to think about what it says. Some of them have, I suppose. Some people who would never access sites that are purely and simply about bisexuality. When someone does stay on this site for half an hour, and they have found it through her picture, then I feel really encouraged. And that, I suppose, is why I think I was wrong with some of the things I said about Angelina Jolie. I stand by the idea that, if we “ordinary people” rely on slebs to be our role models and to show us how to live our lives, then we are sunk. The issues we face are simply too different, and we will never be able to change things if we rely on help from “above”. But. It seems that Angelina can reach parts that I certainly can’t – and nor can the bi community, or health educators, or politicians, or books, or less glamorous spokespeople. Obvious really. She is a larger than life person, yes, someone with a special life, which is one of the things I have a problem with. But as that is what many people really want her for, and, although this may sound harsh, to live through her, then she certainly is valuable as a spokeswoman, a beacon for, bisexuality – or indeed anything else. Because she – or her image – is certainly doing something I can’t. The next post will have absolutely nothing to do with celebrity. Promise. You couldn’t make it up – although someone obviously has. A bisexual dating show where a woman who is quite literally famous for being famous is getting “16 gorgeous straight guys!" and "16 hot lesbians!" to compete for her affections on the MTV show A Shot at Love with Tila Tequila. It sounds positively demure besides her previous series: Pants-Off Dance-Off. And that’s “pants off” in the underwear sense of the word, rather than simply an overly constricting pair of trousers. Now Tila Tequila is most famous for having completely invented herself as a sleb through self-promotion, and clearly she’s very good at it, with currently 2,170,161 MySpace friends – more than when I looked a couple of hours ago. Now she’s a singer/actress/presenter/model/stripper/all-purpose brand, and good luck to her I suppose. “A girl who makes out with other slutty chicks at parties and then claims to be bisexual because it's trendy to say so and gets people's attention on Myspace. Now this show has attracted a lot of commentators – both bi (who hated it), anti-celeb (who hated it) and homophobes (who hated it). But also, unfortunately, people who didn’t necessarily hate it but considered that it gave a marginalised group (bisexuals) some much-needed publicity. Yet, given that millions of people are watching this programme, what can we make of it? In fact, it reminds me in some ways of the Jerry Springer programmes of the 1990s, where bisexuals took their place among all the other freaks who wanted to show off in public. It seems to me that the problems with A Shot at Love with Tila Tequila are a) that she had to lie to the contestants, making out that she was straight/lesbian – and Any Fule Kno that bisexuals lie; and b) that because there is nothing else about bisexuality on TV, this is seen as What Bisexuals Are Like. The world at large has a strange and unusual view of “bisexual relationships”. Even Ms Tequila herself says: “The show will be about me finding love as a BISEXUAL!!!!! THAT IS CRAZY, RIGHT?”. Er no… how sad it would be if that were true. But it isn’t and I can’t believe she thinks so either. The world is actually full of bisexuals having good, bad and indifferent relationships, if people only knew. And they certainly aren’t going to be finding out through this show. Of course, there are stereotypes a gogo in this programme, but that’s reality TV. Anyone who seriously thinks that, say, The Bachelor, is a realistic view of heterosexual relationships needs to be thrown into a vat of Mills & Boon novels and left to claw their way out. The problem isn’t that there are wacky views about bisexuality in the media – there are wacky views about everything - it’s that all of them are wacky. Isn’t it about time that there were some genuine ones too? Tila Tequila has added another 46 friends.